In a humpty-dumptied world of nationless states and trans-global megalithic corporations with little to no accountability, the institutions that have traditionally safeguarded the safety of the world’s populations have not kept pace with the changes wrought by the information explosion. worldzight (observation changes the observed) is an improvisational experiment in participatory action democracy, premised upon the idea of bringing together trans-global constituencies bound together by race, religion, issues, convergence of interest, or any one of a number of shared connections to a given “cause” in a peaceful, non-obstructionist manner. 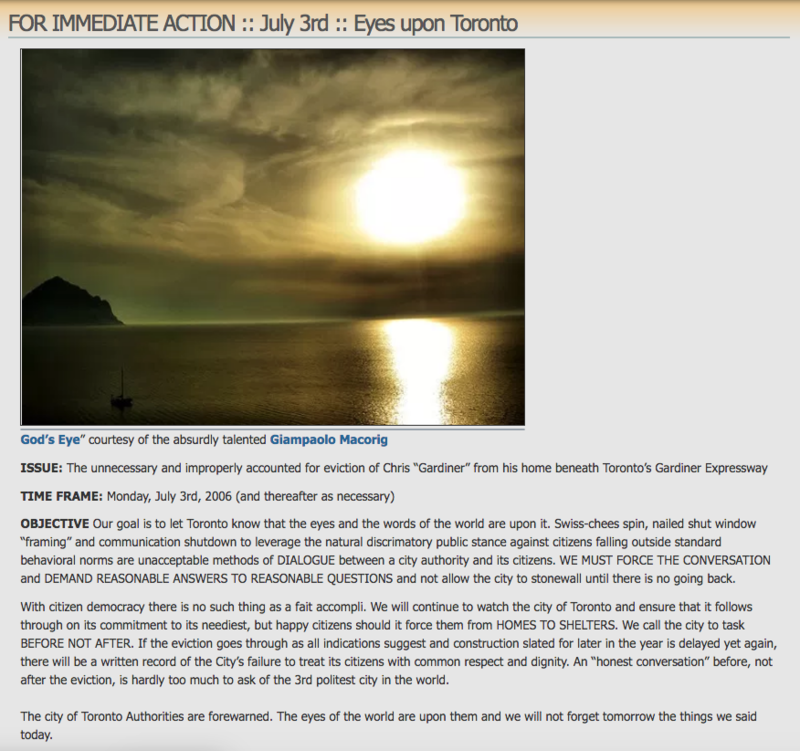 Worldzight believes that one-to-one or one-to-few outreach directed outward from the central point of conflict can work in tandem with judiciously selected micro-targeted “one to many” mass media outlets and direct action by incentivized constituencies to serve as a countervailing balance against increasingly dangerous Gilded Age economic policies that increase class separation via concentration of wealth and decrease meaningful communication across ideological divides via an increase in “echo chamber isolation.”. The goal is NOT revolution, but velvet-style change and transformation from within. Worldzight, born of improvisational necessity late in the afternoon on July 2nd, 2006, was inspired by “homeful” advocate Ana Crisan’s dogged determination to protect her friend Chris’ unjust eviction from his home of many, many years beneath Toronto’s Gardiner Expressway.